General Electric's Chief Technology Officer recently said that the company's support of Apple's iPhones and Macs for employees is a recruiting positive that communicates to candidates that it is a "contemporary company," yet another sign that Apple is continuing to grow in the enterprise market. The Wall Street Journal offered up a profile of the 120-year-old multinational corporation on Wednesday to illustrate a larger trend toward Apple in the Enterprise. GE has been operating a pilot project testing out Apple's Mac notebooks and desktops for its employees for over a year. According to the report, the company now has about 1,000 Mac users. Given that GE has roughly 330,000 computers, the Mac has plenty of room for growth within the company. "There is a learning curve, and we recognize that it may not work perfectly yet," Simpson said of the project. "I think it will continue to grow on [employee] demand." Those numbers, however, could rise quickly once employees are made aware of the program. The company has yet to publicize the Mac option internally, though it is readying the option across all of its divisions. "All businesses are participating at some level in making this [option] available to their employees," Greg Simpson, GE's chief technology officer, told the Journal. Employees at the company have been allowed to choose iPhones in addition to Research in Motion's BlackBerry devices since 2008. Currently, about 10,000 GE employees have taken advantage of the opportunity, while about 50,000 employees still use BlackBerrys. Simpson went on to suggest that recruitment candidates view support for employees Macs and iPhones as an indicator of whether a company is up to date. "To find out that we support Apple, we support iPhones, we support Macs, it does take away one question for people, 'Are they a contemporary company or not?'" Simpson said. "I think that is a recruiting-positive thing." Apple is expected to see impressive growth in its device sales to businesses in coming months. Market research company Forrester Research released the results of a survey earlier this month that points to as much as 50 percent growth for Apple this year. According to the report, new "Bring Your Own Device" policies have made IT departments more open to Macs, iPhones and iPads. 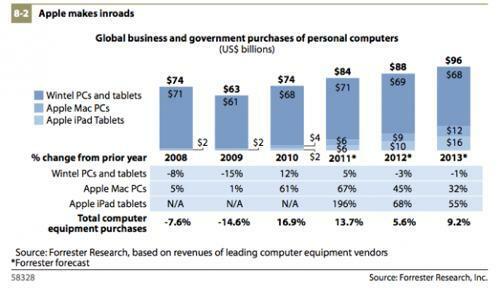 Forrester expects corporate and government spending on Macs and iPads to increase to $19 billion this year, while PC spending is expected to slide from $71 billion last year to $69 billion in 2012. A report from last November claimed Apple is seeing increased adoption of its products among enterprise customers now that it has become "easier to work with." In its most recently quarterly earnings conference call, Apple revealed that 93 percent of the Fortune 500 are deploying or testing the iPhone and 90 percent of them are deploying or testing the iPad. Some companies have had an easier time adopting the iPad than the Mac. For instance, Boston Scientific Chief Information Officer Rich Adduci told the Journal that it had experienced compatibility problems between its own systems and Macs. "The reality is they make a terrific product, but there are some compatibility challenges with our corporate computing infrastructure," he said. However, the company hasn't experienced the same issues with the iPad. According to the report, Boston Scientific, which makes medical devices, partnered with Apple the day after the iPad was released to use the new tablet for sales. The company plans to move entirely to the iPad by the end of the year, the report noted. "Technically, we will be able to support everything on an iPad," Adduci said.